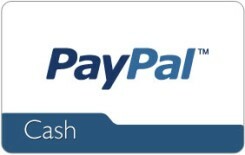 Get yourself a £25 PayPal e-Gift Card for free with Swag Bucks! PayPal is great alternative to carrying around cash and other cards. It is simple to use and is accepted at most stores and businesses! Want to turn your SB into CASH? This is your chance! When you snag this prize, £25 (British Pounds) will be deposited into your PayPal account. Use the money for anything - your gas bill, car bill, gifts - absolutely anything!